"Earth : Portrait of a Planet" book back in your dorm room? Wondering whether one of the library reserve copies is available? Want to check availability for reserve materials for other courses by course number or instructor? Left your book in your dorm room? Wondering whether the library reserve copy is available? Check here. The Fifth Edition of this bestselling textbook features stunning art, the most up-to-date science, and a wealth of online learning tools, all developed under the critical eyes of Stephen Marshak. Heavily revised with remarkably detailed photographs, animations, and maps, the text offers rich and engaging pedagogy, an expanded chapter on energy, and coverage of recent global events, from Hurricane Sandy and the Washington Landslide to Typhoon Haiyan and the Japanese Tsunami. Elizabeth Kolbert's environmental classic Field Notes from a Catastrophe first developed out of a groundbreaking, National Magazine Award-winning three-part series in The New Yorker . She expanded it into a still-concise yet richly researched and damning book about climate change: a primer on the greatest challenge facing the world today.But in the years since, the story has continued to develop; the situation has become more dire, even as our understanding grows. Now, Kolbert returns to the defining book of her career. She'll add a chapter bringing things up-to-date on the existing text, plus she'll add three new chapters - on ocean acidification, the tar sands, and a Danish town that's gone carbon neutral - making it, again, a must-read for our moment. Over the last half a billion years, there have been five mass extinctions, when the diversity of life on earth suddenly and dramatically contracted. Scientists around the world are currently monitoring the sixth extinction, predicted to be the most devastating extinction event since the asteroid impact that wiped out the dinosaurs. This time around, the cataclysm is us. In The Sixth Extinction, two-time winner of the National Magazine Award and New Yorker writer Elizabeth Kolbert draws on the work of scores of researchers in half a dozen disciplines, accompanying many of them into the field: geologists who study deep ocean cores, botanists who follow the tree line as it climbs up the Andes, marine biologists who dive off the Great Barrier Reef. dedicated to publishing the most significant and cutting-edge research on the science of climate change, its impacts and wider implications for the economy, society and policy. Coverage includes original paleoclimatic, diagnostic, analytical and numerical modeling research on the structure and behavior of the atmosphere, oceans, cryosphere, biomass and land surface as interacting components of the dynamics of global climate. Contributions are focused on selected aspects of climate dynamics on particular scales of space or time. CP covers all temporal scales of climate change and variability, from geological time through to multidecadal studies of the last century. Studies focusing mainly on present and future climate are not within scope. The main subject areas are (1) reconstructions of past climate based on instrumental, historical and proxy data (including ice) archives, (2) improvements of the precision and accuracy of proxy data, and (3) simulation of past climate and model-based interpretation of palaeoclimate data. The Research Journal of Environmental and Earth Sciences publishes original research papers on main aspects of Earth and Environmental Sciences such as Atmospheric/Climate, Oceanography, Palaeoclimate, Palaeontology, Planetary Geology, Solid Earth Sciences, Environmental Chemistry, Environmental Biology, Ecology Geoscience and Environmental Physics. Climate research concerned with large-scale variability of the atmosphere, oceans, and land surface, including the cryosphere; past, present and projected future changes in the climate system (including those caused by human activities); climate simulation and prediction. Want to know whether Bates subscribes to a journal? 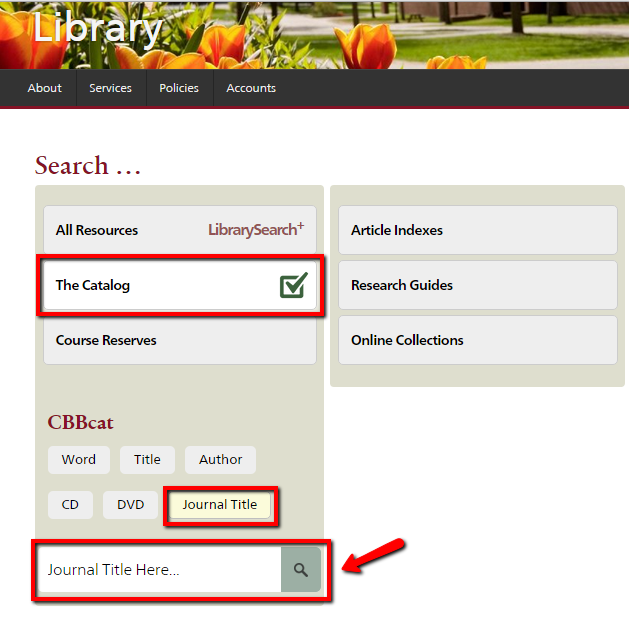 You can perform a "Journal Title Search" from the CBBcat search on the Ladd Library home page. The Intergovernmental Panel on Climate Change (IPCC) is an intergovernmental scientific body established to aggregate, review and publish scientific, technical and socio-economic information regarding climate change. This information is frequently provided in the context of the local and global impact of that change. Below you will find links the homepage for the IPCC site as well as to selected content provided therein. This link will take you to the IPCC gateway. This link will take you to the portal for all IPCC publications. This is the latest in a continuing series of reports describing the current knowledge of climate change and its impact. A link the the PDF version of the complete document (English).